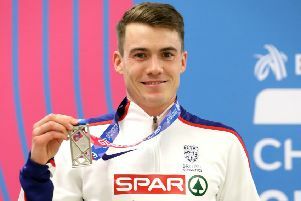 Jake Wightman is ready to sacrifice an Olympic outing after surging into the 1500 metres final at the European Championships glory with a storming surge in last night’s semi-finals in Amsterdam. The Capital prospect, 21, roared from the middle of the pack to hold off 2014 silver medallist Henrik Ingebrigtsen and take victory in 3:39.32, the fastest of the round. With tomorrow night’s final set to be a tactical clash, it leaves the former European junior champion with only a slender chance of getting the qualifying mark he needs to reach Rio 2016 next month. But Wightman concedes the opportunity to take a first senior title is too good to pass up after proving his worth here. With team-mates Tom Lancashire and Lee Emanuel missing out, Wightman will go solo in the final and he admits a surer showing might be required after his fight through the pack. Elsewhere tonight, Scots hope Lennie Waite gets an Olympic dress rehearsal in the steeplechase. 2008 Olympic champion Christine Ohuruogu will attempt to secure her Rio berth in the women’s 400m final alongside team-mate Anyika Onuora while Martyn Rooney will aim to defend his men’s 400m title.